I have been painting out side as often as I can. I have a portable easil and paint box that fits into the bike trailer. I leave early in the morning and am gone for maybe and hour and a half or two hours. I love this going out and painting landscape. It is a good struggle that helps me see and appreciate the world around me. It uncovers hidden beauty. 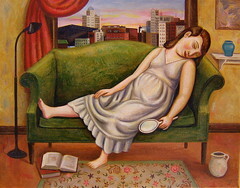 This painting of the woman who is reclining on the sofa has a scene of Grand Rapids in the background as seen from the Wealthy Street overpass. This is one of my favorite views of our city. The city lays down like a young man's dream.